In the aftermath of the rise of social media and the explosion of smartphone use, big data has become a buzzword in business and political circles. There are an increasing number of success stories that highlight social media marketing and social big data marketing. 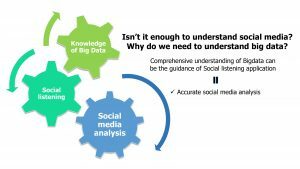 As more and more organizations and political groups start using social listening systems by trawling data from different platforms, analyzing the data and using the findings as a reference for making decisions, one wonders how many people truly understand big data and all it has to offer? When marketing personnel start using social listening tools to monitor their brands, in addition to the tremendous amount of data generated, do they realize that this data could also create value? Before understanding the competitive edge that social listening can bring to an enterprise, it is crucial to grasp the correlation between social listening and big data. IBM’s original definition of big data indicated that it was characterised by the “3Vs” – Volume or the sheer amount of data, the Variety of sources and types of 3data and the Velocity or speed at which this data must be processed. Later, it was suggested that Veracity or the accuracy of the data viz a viz biases and abnormality and the Value the data brings in terms of business or social benefit should also be added to the 3Vs. The term big data was proposed by IBM, the famous American computer technology company. It is currently used to describe digital information in a variety of fields such as documents on the Internet, social media data, video archives, astronomy, medicine, military records etc. Its processing methods involve technologies such as Artificial Intelligence, Machine Learning, Data Mining and Hadoop (an open-source data processing software framework). Different analysis software and platforms are also often referred to as big data . Big data is characterized by its complexity and the utility gleaned from the information collected and analyzed via technology for commercial and other use. While data collection technology is rapidly maturing, the cost of data storage has been declining and, boosted by the development of cloud technology, the global volume of data is burgeoning. The result is that we now find ourselves in the big data era, enabling data scientists to explore unprecedented opportunities in different fields. Social media listening technology monitors how your target audiences talk about the brands, people, products, or services you care about in the long-term, on an ongoing, on-time, and real-time basis using keywords. However, the reason why social media listening tools are able to provide valuable intelligence is related to the 5Vs of big data. IBM’s original definition of big data indicated that it was characterized by the “3Vs” – Volume or the sheer amount of data, the Variety of sources and types of data and the Velocity or speed at which this data must be processed. Later, it was suggested that Veracity or the accuracy of the data viz a viz biases and abnormality and the Value the data brings in terms of business or social benefit should also be added to the 3Vs. To summarize, big data is, by definition, diverse in its sources and constantly updated at high speed. It can be accumulated in a huge amounts, but the accuracy of the data will determine whether it can bring you value. Although big data was derived from the business data processing model a decade ago, the so-called “big data era” actually started in 2012 because the data processed in the past was usually structured data. From 2012 onwards, however, unstructured data has become the main form of data, including blogs, pictures, texts, videos, etc., and the volume of this data has grown faster than structured data. This is an important watershed highlighting the diverse, high-speed and large-scale characteristics of today’s big data. Grasping accurate unstructured data will help you better understand the market situation that pertains to your business or organization and determine the appropriate strategy. Isn’t it enough to understand social media? Why do we need to understand big data? Social listening technology monitors how your target audiences talk about the brands, people, products, or services you care about in the long-term, on an ongoing, on-time, and real-time basis using keywords. However, the reason why social listening tools are able to provide valuable intelligence is related to the 5Vs of big data. For example, social media listening can help you analyze the brand value of different audience groups, understand different sources of information received by the audience, master the audience’s discussion language and mood, instantly understand public opinion trends, analyze competitors, and more. Understanding the different characteristics of big data is an important guide to the application of social listening. Therefore, mastering the characteristics of big data determines the accuracy of the social data analysis. It will directly affect the editing, reviewing, proportioning, comprehension and extension of data with different characteristics during the process of social listening, and your interpretation and prediction of market phenomena. Many people think that the word “big” sums up what big data is all about; however size is only part of the picture. Volume alone is not enough to help improve product quality, decision-making and business model. In fact, the quantity and immediacy of information can easily be solved through the use of traditional programming techniques. However, the diversity of data types requires excellent analysis; moreover, finding insights from data that has not been studied before is the essence of big data analysis . That’s why a good grasp of big data and what it can do for you is essential to effectively employing social listening tools.